The 7 Steps to Unlock and Leverage Your Passion is a self-help audio CD that offers inspiring yet practical steps on how to live a passion-filled life on purpose. With the principles outlined in this audio CD you will learn how to identify your various passions and streamline it to determine your most marketable skill. ♣ What is my purpose in life? ♣ How do I discover my God given-talents? ♣ What do I love to do and Why? ♣ How can I leverage my passion? ♣ What does success look like to me? Omosede Oriakhi says: I listened to this CD over and over again in the car, I must say it was fun and very informative. Nina Ijere is definitely an amazing motivational speaker who relates well to the audience with an awesome concept so brilliantly illustrated with powerful stories and examples of real life experiences. I would recommend this to anyone who is interested in personal growth and development, no matter at what level or stage of life, you would definitely learn great lessons from it. Everyone should own this CD and listen to it very often, you can’t go wrong with this teaching. Erma Heyliger says: My passion for the Funeral Business has always been one of my dreams and aspirations fulfilled. As far as being able to have a career in what needs to be dealt with in a professional manner, compassion and a meaningful way. Life as a young professional on the Mortuary Field has opened my mind to endless insight and culture. 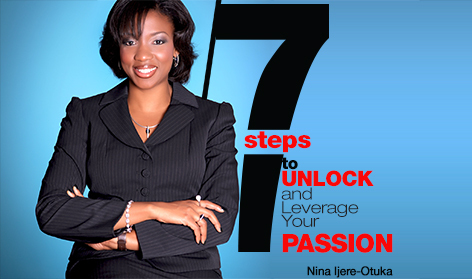 Nina’s 7 ways to unlock and leverage your passion should and will make it to every Woman’s night stand. It has meaningful messages and inspirational blue print that I feel obligated to exceed all my expectations and make new ones. Making my career steps and reaching where I want to be and breaking barriers of social and economic makes me feel accomplished. Self Love determines your aptitude for success and triumph.- Erma Heyliger. Looking forward to your reviews and your comments below. Here’s wishing you great success! My passion for the Funeral Business has always been one of my dreams and aspirations fufilled. As far as being able to have a career in what needs to be dealt with in a professional manner, compassion and a meaningful way. Life as a young professional on the Mortuary Feild has opened my mind to endless inisights and culture. Nina’s 7 ways to unlock and leverage your passsion should and will make it to every Womans night stand. It has meaningful messages and inspirational blue print that I feel obligated to exceed all my expectations and make new ones. Making my career steps and reaching whereI want to be and breaking barriers of social and economic makes me feel accomplished. Self Love determines your aptitude for success and triumph.- Erma Heyliger. This CD is made for all kinds of people. If you do not have a dream or anything you are passionate about yet, or you do not know for sure what you want, Nina’s 7 ways to unlock and leverage your passion will help you think of a dream. If you have a dead dream, it would stir up courage and desire in you so strong to wake up that dream, if you are already on your way to achieving your dream, it would help you believe in your dream and yourself. This is a must have. I listened to this CD over and over again in the car, I must say it was fun and very informative. Nina Ijere is definitely an amazing motivational speaker who relates well to the audience with an awesome concept so brilliantly illustrated with powerful stories and examples of real life experiences. I would recommend this to anyone who is interested in personal growth and development, no matter at what level or stage of life, you would definitely learn great lessons from it. Everyone should own this CD and listen to it very often, you can’t go wrong with this teaching. Thanks for sharing your experience after listening to the 7 Steps audio CD, your kind words resonates and I appreciate you. Ogechi, thank you so much for listening. Your comment about the 7 Steps audio CD are appreciated. Hi Erma! It was nice meeting you and thank you for listening to the 7 Steps audio CD. I am glad to hear that it blessed and inspired you to greater heights. I am indeed humbled.